As ther Web evolves to incorporate new standards and the latest browsers offer new possibilities for creative design, the art of creating Web sites is also changing. Few Web designers are experienced programmers, and as a result, working with semantic markup and CSS can create roadblocks to achieving truly beautiful designs using all the resources available. Add to this the pressures of presenting exceptional design to clients and employers, without compromising efficient workflow, and the challenge deepens for those working in a fast-paced environment. 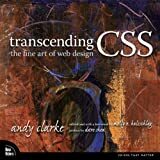 As someone who understands these complexities firsthand, author and designer Andy Clarke offers visual designers a progressive approach to creating artistic, usable, and accessible sites using transcendent CSS. In this groundbreaking book, you'll discover how to implement highly original designs through visual demonstrations of the creative possibilities using markup and CSS. You'll learn to use a new design workflow, build prototypes that work well for designers and all team members, use grids effectively, visualize markup, and discover every phase of the transcendent design process, from working with the latest browsers to incorporating CSS3 to collaborating with team members effectively, and much more.